Biogases, Waste materials, Pollution, Biochemical process, Renewable energy, Microbial strain. For anaerobic digestion (for food waste-only) and a co-digestion process (for mixture of cow manure and food waste) has been reported for biogases formation by utilization of mesophilic and thermophilic bacteria or archaebacteria which has shown their best performance and microbial structure at (37°C) and (55°C) temperatures respectively . And highest methane yield, (480 ml/g volatile solid~VS) is reported in mesophilic digester (MDi) fed with food waste alone whereas 26% or more methane is reported in mesophilic co-digestion (McoDi) of food waste and manure. In bioprocess of MDi and McoDi, Chloroflexi (54%) or Methanosaeta; and Firmicutes (60%), Methanobacterium or Methanosaeta; respectively are dominant microbial strains, applied in alone or combination forms whereas in thermophilic bioprocess systems i.e. thermophilic digester (TDi) and thermophilic co-digester (TcoDi), Thermotogae, Firmicutes and Synergistetes or Methanothermobacter are reported as dominant microbial strains and utilized in alone or combination of their strains . Biogas production is found via biodegradation of organic matter under anaerobic conditions (absence of oxygen). And it is produced as mixture of gases (methane, some carbon dioxide or hydrogen sulfide) with upgrade of the bio-waste treatment plant. Optimization of the plant is required for maximum energy quantity (Biogas, bioenergy or bio-rest) with environmental benefits. Material balance analysis of the plant's operation can estimate the amount of produced methane which can be further generated the increase electricity via optimizing the operation of the plant . Laboratory glass digesters have used seawater to dilute organic wastes for biogas production. In the anaerobic digestion of organic wastes, seawater (20245 ppm as 10% total solids) is used as a diluent for dilution of organic waste below the inhibitory level which has helped in slow acclimation of the micro-organisms involved in biogas production to the seawater conditions. It has increase in the biogas production rate at the end of the experimental period (60 days) . Various methane reactor designs has been utilized depending on the types of organic loaded waste water, solids and slurry which has helped in providing maximum and reliable biogas yields for heat and/or power generation. Retech energy technology or turnkey plants have helped for biogas production with different projects partnership with leading technology providers and local contractors via COD removal in different water bodies . Uncontrolled and unplanned biodegradation of organic matter under anaerobic conditions in pond or any other big water resources causes the methane production in range of 590 million and 800 million tons each year and released into the atmosphere which is potent greenhouse gas than CO₂ in the our environment responsible for climate change global issues. Organic matter from food waste, animal manure and agricultural byproducts is used in biogas digesters which have provided controlled condition for biodegradation of a waste product via reducing the amount of food waste and other organic materials being sent to landfill or deposal to water bodies . Kitchen waste (KW) has been used for biogas production and it has shown high biodegradability, calorific value and nutritive value to microbes. Biogas production from KW with co-digestion of cow manure (CM) via anaerobic digestion (AD) has provided as an alternative energy at room temperature (25°C-30°C) and at temperature of 37°C also for its degradation rate analysis. 1.0%, 1.5% and 2.0% (NaOH) solution based on wet matter of kitchen waste are added for improved biodegradability (6.8 ml/gm at 1.5% NaOH) and biogas production (doubled quantity compared to untreated). Reactor performances (digestion rate) are also found faster at 37°C at a loading rate of 200 gm/L compared to room temperature . Generating of bio-gas (methane) from food waste from college canteen has reported by use of anaerobic thermophilic digestion process and claimed for maximum biogas production from the digested food waste in period of 90 days. Methylotroph population in the activated sludge has used methane as a carbon source for their growth. Mixture of 76% methane and 24% carbon dioxide as biogases are reported from decomposition of food waste . Collection of Kitchen (food waste around 30 kg) has done from boy’s hostel mess of 350 students as feedstock for anaerobic digester reactor system to produce biogas energy. Biogas is utilized as energy source for cooking and also for various purposes. Application of bioreactor is based on knowledge and information about design and construction of digester to generate biogas. Pilot study has been done for kitchen waste generation and fuel saving process by using biogas plant in engineering college hostels of India. Biological wastes are found in three forms which are kitchen wastes, agricultural wastes and animal wastes and these can utilized with the help of various technologies adaptation for leading to the use of renewable energy systems effectively and efficiently . In this paper, author will discuss about the biogas synthesis possibility from utilization of different types of biological /organic waste via application of anaerobic fermentation via bioreactor as digester. Food waste (FW) is one of most available organic wastes with good biodegradable nature, obtained from precooked and leftover food and is normally discharged from food processing industries, households, mess of hostels, canteen of school/engineering college and hospitality sector and shown in Figure 1 . It is available around 1.3 billion tonnes in quantity from various food sources such as fresh vegetables, fruits, meat, bakery, and dairy products and normally they are found to lose along the food supply chain and shown in Table 1. Last few decades, the amounts of FW are found to increase (278 to 416 million tonnes from 2005 to 2025) due to economic and population growth in Asian countries or countries. It has been reported that the annual amount of urban FW in Asian countries could rise from [10,11]. 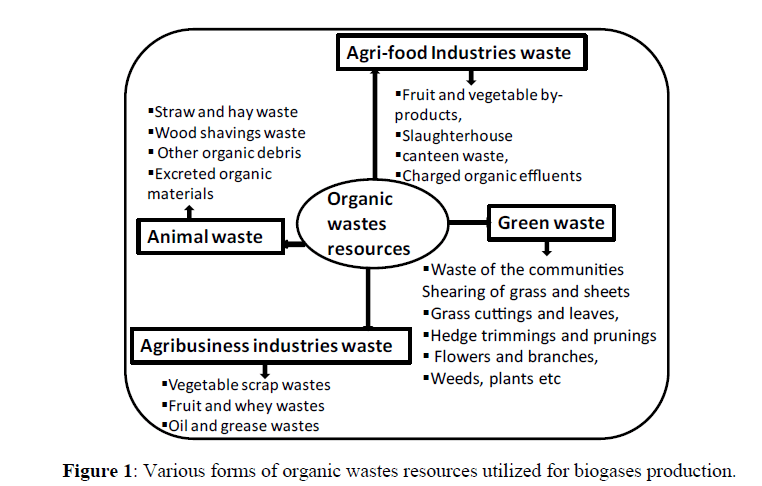 Figure 1: Various forms of organic wastes resources utilized for biogases production. Table 1: Biogases capacities from utilization of different types of organic wastes. India has faced many environmental challenges due to generation of many types (including organic or inorganic) of wastes and its inadequate collection, transport, treatment and disposal as very critical issues. Waste processing facilities can help to separate recyclable materials via waste segregation at source then it can make usefully form including biogas synthesis. Engineered landfill sites for disposal of residual (planned and systematic ways) waste can be utilized after extraction of material resources and can be invested in wasteto- energy facilities. Energy generation from landfill via methane extraction or thermal treatment is done by qualified engineers and environmental professionals via performing of improved waste management systems . Organic waste resources contain environmental pollutants and pathogenic microorganisms also. It is found in varying in composition, quantity and quality. Household waste are made up of made up of food scraps (either cooked or uncooked) and garden waste (grass cuttings or trimmings from bushes and hedges) which is found in biodegradable nature. Human waste is produced in large quantities in urban areas in a variety of ways. Animal waste is used as a source of fertilizer and can be applied directly to the land, or as a source of energy via direct combustion (after drying) or through digestion to produce methane gas. Agricultural residue is waste materials obtained after the processing of crops (maize stalks, rice husks or foliage). Simple combustion on an open fire is used to get complex energy production processes this waste as a fuel stock . Plant-available N is reported as growth-limiting factor. Meat and Bone Meal (MBM) and Composted Fish Sludge (CFS) are reported as biological wastes and its 48%-73% of N has applied to soil which is taken up in aboveground biomass as Mineral Fertilizer Equivalents (MFE%) of 53%-81%. Waste resources from Meat and bone meal (MBM) and composted fish sludge have shown positive effects under more nutrient-deficient conditions . Biogas production has found from Biologically Degradable Municipal Waste (BDMW) and Biologically Degradable Industrial Waste (BDIW) and these wastes (i.e. slaughter waste and grass) in agricultural biogas stations are reported to significantly improve their economy by generating the biogases and shown in Figure 2. About 100 wastewater cleaning plants are operated in the Czech Republic using regular sludge processing into biogas and electricity generation form it is utilized for the needs of own operation of Waste Water Treatment Plant (WWTP) as well as heat energy utilized for operational and administrative facilities . 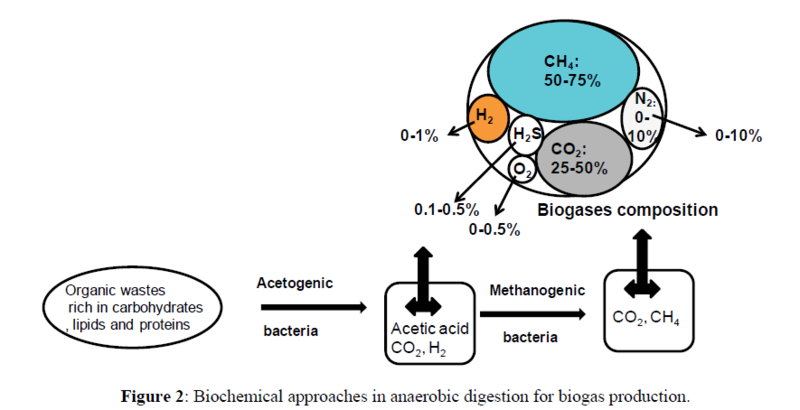 Figure 2: Biochemical approaches in anaerobic digestion for biogas production. Food waste is generated from subsequently discharged, lost, degraded or contaminated food material during the process for human consumption. Food waste problem is currently increased in due to advanced life style and huge human population around the world and shown in Figure 3. Further it can be occurred from all contributors to the food supply chains, agricultural and industrial sectors, as well as retailers and final consumers. This waste quantity is increased at donation of edible fractions to social services. Food waste from industrial processes is employed for production of biogases, biofuels or biopolymers and in composting process it was utilized via recovery of nutrients and fixation of carbon. By proper management via incineration and landfilling processes, food waste can utilized for recovery of energy or related products . Figure 3: Food waste variety sources with their respective quantity. Handling of food wastes is done for production of biogases which is generated from Gari producer industry in Nigeria and these waste are mainly cassava peels, shaft from processed cassava, yam, plantain, banana agro-waste, corncobs, citrus, pastures and sugar cane, forage, organic wastes etc. It had utilized into useful products for human and animal consumption ancient periods in Nigeria. Now, bioconversion of theses waste to useable energy is more practice for enhancing of sustainable energy like biogases generation. In ancient periods, utilization of waste had occurred by burning solid fuel for heat, by fermenting plant matter to produce fuel, as ethanol, or by bacterial decomposition of organic waste to produce methanol. It has greatly enhanced and ensured sustainable economic development in Nigeria and the world at large . Food waste disposal is big challenge in open place because it generates bad smell to environment due to uncontrolled biodegradation. In Ontario, Canada, municipalities, household waste composition has been studied by use a direct measurement methodology for analysis of range of waste categories, including food waste. Household waste composition study in 2012-2015 had gathered information from 9 Ontario municipalities and then food waste (avoidable fruits and vegetables) were aggregated and analyzed to develop the estimates of average food waste (2.40 kg/week) in the 35.4% of garbage stream. Amounts of food waste were compared from Urban households (significantly greater) to rural households disposal in the spring (p=0.01) and summer (p=0.02) seasons . Food waste has a shown negative effect on food security and quantify household food waste along the rural-urban continuum has been reported in three South African mid-sized towns situated along an agro-ecological gradient. Quantified the types of foods and drinks from households threw away has identified the causes of household food waste in the three sites which are found more households wasted prepared food (27%) than unprepared food (15%) and drinks (8%). In the 48-hour recall period, households’ unprepared food thrown away has found in greater quantities (269 g-610 g) compared to prepared food (121.0 g-132.4 g) and drinks (77.0 ml-192.5 ml) with 90% confidence interval of their values. Per capita food waste (unprepared food waste (5 kg-10 kg), prepared food waste (3 kg-4 kg) and drinks waste (1-3 litres) per person per year) has estimated for other developing countries and it has lowered than most developed countries [19,20]. Deployment of thermochemical waste-to-energy systems are applied by knowing the fundamental characteristics of waste streams. Gasification of waste streams is done based on their thermochemical properties. Characterizations of green waste solid with municipal solid waste have been reported in terms of chemistry and energy content which are found in Brisbane, Queensland. The chemical properties of the combustible portion of waste have been measured directly with comparison of their calculations based on their weight ratios in municipal solid waste. The moisture content of green waste is reported from 29% to 46%. The variation of samples' energy content, has found between 7.8 MJ/kg and 10.7 MJ/kg. The total moisture content of food wastes and garden wastes are found the 70% and 60% respectively . Conversion of green waste into renewable energy has found environmentally as well as financially beneficial also. Exploration of the energy potential has shown in oil/ fuel market via conducting a benefit cost analysis. Selecting a market for conversion of organic waste into biogas is advantageous in term of environmentally as well as financially benefit in cost ratio of three times higher after conversion. Conversion and production process for biogas has shown a huge margin and the policy makers and planners of Talaad Thai or any other countries can involve by investing their greater effort in initiating this plans in other markets of Thailand in order to make this planet clean and green . Green wastes are agricultural green wastes which are biodegradable nature waste and it is composed of garden or park waste, (grass or flower cuttings and hedge trimmings, as well as domestic and commercial food waste). The differentiations of green wastes are high in nitrogen contents as opposed to brown waste (primarily carbonaceous). It can be used as non-food crop to produce cellulosic ethanol also via reducing the usage of petroleum gases on burning generate harmful gases. Green waste collection can be done via municipal curbside schemes or private waste management contractor businesses . Green Waste (GW) is found in abundant quantity every time and usually mixed with the organic fraction of municipal solid waste under Municipal Bio-waste (MBW). GW has slow biodegradability nature with minimization of its biogas revenues . Optimal GW/MBW mixing ratios and old landfill leachate/sewage sludge inoculum ratios has shown important role in optimal biogas production. Co‐digestion tests of GW and MBW has been conducted for MBW/GW (at 0:100, 30:70, 50:50, and 60:40) based on dry Volatile Solids (VS) with maximum biogas production yield (318 mL/g VS) at 60:40 MBW/GW ratio using leachate as inoculum. The peak biogas yield are reported at leachate/sludge ratios of 50:50 and 30:70 via utilization of the Design Of Experiment (DOE) for methane content and biogas cumulative volume produced from co‐digestion at different VS and leachate percentages . Rural areas are good sources of green leaves and stems from various types of vegetable crops, banana, grapes, etc. which are found underutilize form after harvesting. Normally some of green leaves and stem had been used as fodder for animals from ancient period and are not completely digested by them. Green leaves are good source of proteinous matter, waxes, resin, lignin and cellulose. Green leaves and stems has used for production of good manure because of people were not aware about cellulose and lignin in green leaves and it cannot give good quality of manure and even cannot be decomposed easily. The green leaves and the stems can be crushed to produce juice which can be fermented to produce biogas for cooking . Biomass potentials of green waste from residual grasslands have been been assessed in Baden-Württemberg, Germany. Conservation of grasslands can be maintained at low intensity land (landscape maintenance sites), riparian stretches along ditches and streams, and municipal green spaces (public lawns, parks and sports fields) as an area types with their possibility of growth. Their biomass can be utilized for biogas yields via determination through a sampling program or through interviews with experts . Distinguishing between theoretical technical and realized (economic) potentials can be applied with subtraction of unsuitable areas and fractions from the theoretical potentials. Theoretical potentials for Schwäbisch Hall County are estimated around 21 million m3 of biogas with high percentage of the theoretical residual biomass potential of green grasses. Due to various technical, legal, ecological or management (economic) constraints the extract estimation may be found different. All residual biomass available under current management practices can be accessed to 6.1% of the theoretical maximum potentials of total grasses quantities . Effects of Alkaline [NaOH] solution on mixture of pineapple, plantain and cassava peelings as the feed stock has been analyzed for generation of fermentable sugars for more amount of biogas synthesis via application of practical / laboratory scale experimental design for digester temperature (27°C-35.5°C) throughout the period of experimentation . There are various types of reported waste of agricultural crops which is obtained from sugar cane, cassava, corn etc, agricultural residues like rice straw, cassava rhizome, corn cobs etc, wood and wood residues (saw dust, pulp wastes, and paper mill waste). Crop residues have been digested either alone or in codigestion with other materials utilizing wet or dry processes. Agricultural sector can provide the solution via processing crop biomass through co-digestion together with animal manures under potential utilization of the largest agricultural waste stream. Co-digestion has provided good opportunity to farmers to treat their own waste together with other organic substrates for obtaining the valuable products like biogases as well as heat, electrical power and stabilized bio-fertilizer . Biogas production in eleven rural plants in Poland has been utilized for analyzing the capacities of each plant for generation of 500 kW or excess kW of electricity from supply and processing of organic, agri food waste mixed with silage. Many barriers are no political support for biogas installations and also for investor, no permission for installation of plant due to administrative burden of mandatory procedures which are found to persist in development of biogas plants as well as every other renewable source of energy. Biogases quantity can be enhanced by more focus on management of agricultural waste (i.e. spent wash or potato pulp) as well as good research work plan in their pretreatment and sacharification processes . The generation of biogas (as alternate source of energy in rural region of India with 80% of the population) can be done from food waste/refuse or peelings, agricultural and animal waste produces energy. Agricultural resources are energy crops, perennial herbaceous grasses, agricultural residues, and aquatic weeds have utilized as energy source for electrical energy via mitigation of GHGs emissions from the storage of animal waste also. By utilizing agricultural waste for biogas production, we can enhance our energy security via protecting our environment as well as solving emerging energy crises problems . A simplistic theoretical study on anaerobic digestion is done for predicting the biogas amount of agricultural wastes. An algebraic equations is used instead of biochemical equations which is required many input parameters as well as computation time. This calculation has helped to get simplified model for prediction the biogas amount produced via agricultural energy feasibility studies on dimensioning bioreactors for digesting animal waste slurries. It has used for other feedstock materials in an effort to expand anaerobic digestion systems for clean energy production . Different pretreatment methods (mechanical, thermal, chemical and biological) have helped in facilitating the anaerobic digestion by increasing the rate of organic matter hydrolysis. Hybrid method (physico-chemical) has found to involve more than one technology which has been useful in enhancing waste solubilization and anaerobic digestion. Cost of operation and the benefits derived in form of biogas can be more successful via waste minimization and its proper treatment at large scale application . In this regards, milling process has found to help in without any inhibitors generation like furfural and hydroxyl-methylfurfural (HMF) (a break-down product of fructose) via enhancing biogas (methane) production (5%-25%). But it required high energy input with high maintenance cost whereas extrusion process (at optimum condition~ barrel temperature 150°C, screw speed 2.5 Hz, moisture content 20% and particle size 2 mm) has helped in enhancing the surface area of agricultural waste which helped in enzymes action for final hydrolysis. It also needs high quantity of energy with high maintenance cost [35,36]. Steam pretreatment/steam explosion (at 2.5 MPa for increased gas generating speed and 90 second period) is applied for increasing cellulose fiber reactivity with 56% enhanced methane yield. But it produces more amounts of inhibitors (i.e. furfural and HMF) and also showed less digestion of biomass due to lignin condensation in this technique . Liquid hot water is applied for solubilization of hemicellulose and lignin products in lower concentrations with less risk of inhibitors production (furfural). This treatment helps in increased enzyme accessibility but it needs high heat energy and effective only at certain temperature . Microwave energy (at frequency 2.45 GHz, power 680 W, time 24 min) is also applied for more percentage of hydrolysis of agricultural wastes with 4%-7% more amount of biogas production than untreated agricultural wastes . Diluted (CH3COOH solution of 4% pretreatment for 7days) or strong acid (2% H2SO4 solution pretreatment for 7days) pretreatment has reported as effective treatment processes via solubilizing hemicellulose components and it has enhanced 44.2 % and 74.6% more methane gas generation respectively. From pretreatment processes, methanogens bacterial are capable of adapting to inhibiting compounds and high cost of acids has more risk of forming inhibiting compounds with corrosion problems . Alkaline pretreatment (2% NaOH solution) has helped in solubilization of hemicellulose and parts of lignin with increased methane production up to 73.4%. But it has also high risk of producing inhibitors with high alkali concentration in reactor may affect biogases formation [41,49]. Anaerobic digestion is performing biological process inside a device via converting organic substrates to biogas in the absence of oxygen and it has been practiced for centuries and there are many reports available on improvement and technological advancement (i.e. for substrates, reactors, treatments, operation and system analysis) via revealing to current research and development progresses for the biogas synthesis . The AD process is required a biomass waste materials for carbon source inside a sealed tank or digester. With help of naturally occurring micro-organisms, organic materials (from food waste, slurry and manure, as well as crops and crop residues) is converted with release of a methane-rich gas (as biogas) and used for generation of renewable heat and power via cutting of fossil fuel use with reduction of greenhouse gas emissions. Digestate as remaining material is found inside the AD and is rich in nutrients used as a fertilizer. This process can be performed at mesophilic (25°C-45°C) or thermophilic (50°C-60°C) temperature via maintaining the 5%-15% dry matter in the digester at continuous flow or batch mode. It can be available in single, double or multiple digesters types depending on need or requirement for utilization of organic waste nature or quantity. Vertical tank or horizontal plug flow are shape of anaerobic digester and thermophilic systems are found faster throughput with more rapid biogas production per unit of feedstock and digester capacity via greater pathogen killing . Anaerobic Digesters (AD) types for solid organic wastes utilization are based on biological and technical performance and reliability. It is reported as one-stage, two-stage, and batch systems. Batch systems are cheapest with lowest-tech of all systems but its major drawbacks are lower biogas yield due to the impairment of the percolation process via channeling and clogging. But it has high potential for application in developing countries. Two-stage systems are most expensive and complex system but it has greatest advantage in buffering of the organic loading rate in the first stage with more constant feeding rate of the methanogenic bacteria in second stage . Production of the renewable energy (biogases) from biodegradable waste can overcome our energy crisis problem with utilization of solid waste management via anaerobic digestion. Anaerobic digestion performs controlled breakdown of organic matter which generates methane gas (60%), carbon dioxide (40%) and trace components with soil conditioner. Design considerations of AD system at batch mode yields cost-effective and economically viable processes via conversion of the food waste to useful and clean energy with simultaneously protection to the environment. Design considerations of AD are analysis of gas production, substrates and inoculum utilization, uses and impacts of biogas . Anaerobic digestion improvement can be achieved by optimization of the process conditions, pretreatment of input sludge and increase of process temperature which has best reported for thermophilic process via higher solids reduction and biogas production. Thermophilic process is found best AD, for a high resistance to foaming, no problems with odor, better pathogens destruction and an improvement of the energy balance of the whole treatment plant. Disintegration of excess activated sludge in a lysate centrifuge has caused to increase the biogas production in full-scale conditions whereas rapid thermal conditioning in digested sludge is best and acceptable method of particulate matter disintegration and solubilization . Two-phase anaerobic UASB process has utilized for better sewage sludge disposal and more efficient energy reclamation which has transformed the waste organic components into valuable energy in sludge by thermal and WAO pretreatment in the pilot scale. The qualities and quantities of the effluent and solid residue have been compared with biogas outputs in traditional anaerobic sludge digestion. Sludge components, including carbon, nitrogen, phosphorus, sulphur, were observed and mass balances are analyzed throughout the process with study of the input and output energy balance. Biogas outputs in terms of COD, pretreatment improvement with transformation of carbon substances into biogas production has been reported with higher carbon removal and higher VSS removal . Biogas production from these organic materials via anaerobic digestion techniques could be absolute solution for their proper utilization. Nowadays, biogas-fuelled gas engines are also available and utilized for generation of biogases which has helped in best waste management with an economical energy supply. Anaerobic fermentation of organic materials is utilized in biogases formation and methanogens and acidogenic bacteria (a source of biochemical processes) with lack of oxygen at definite pH and temperature ranges are applied with period of two to four weeks. During biogases formation, hydrolysis, acetogenesis, acidogenesis and methanogenesis steps are required for conversion of organic waste into fuel and biogases can be converted into renewable electricity or useful heat with cogeneration or combined heat and power. Biogases generation from waste organic materials can help in maximization of our renewable energy security with mitigation of water pollution in different water bodies (fresh or saline). In this proposed paper, author will focus on biogases production from different types of organic wastes material which has created a big environmental issue like Chemical Oxygen Demand (COD) or lowing of oxygen content for animal or plants life survival in water bodies. Plentiful quantity of biological wastes availability at worldwide is required its systematic disposal and treatment via producing the sustainable energy like biogases which can solve the energy crisis issue with reduction of greenhouse gases as well as environmental pollution. As methane and carbon dioxide are main components of biogases mixture and is super alternative to composting processes. Anaerobic digestion has helped the production of high-energy renewable fuel like biogas with reduction of COD in different types of effluents from many food or organic compound processing industries via substituting fossil fuels energy. In current period, biogas-fuelled gas engines are available for generation of biogases with best waste management in economical ways. Methanogens and acidogenic bacteria are used a source of biochemical processes in biogases generation at controlled conditions via hydrolysis, acetogenesis, acidogenesis and methanogenesis processes and later biogases is transformed into renewable electricity or useful heat or combined heat and power. Biogases can help to maximize our renewable energy security with mitigation of different types of pollution including water fresh or saline bodies. Curry, N., et al., 2012. Biogas prediction and design of a food waste to energy system for the urban environment. Renew Ener, 41, pp. 200-09. Zamanzadeh, M., et al., 2017. Biogas production from food waste via co-digestion and digestion effects on performance and microbial ecology. Scientific Reports, 7, pp. 17664. Mustafa, MY., et al., 2016. Biogas from organic waste - A case study. Procedia Eng, 146, pp. 310-17. Gamal, El, et al., 1986. Biogas from organic waste diluted with seawater. Halwagi, El MM. Biogas Technology, Transfer and Diffusion. Springer, Dordrech, pp. 417-23. Home biogas: turning food waste into renewable energy. https://theconversation.com/ home-biogas-turning-food-waste-into-renewable-energy-89920. Iqbal, SA., et al., 2014. Anaerobic digestion of kitchen waste to produce biogas. Procedia Eng, 90, pp. 657-62. Mohan S., et al., 2013. Production of biogas by using food waste. IJERA, 3(4), pp. 390-94. Akkoli, KM., et al., 2015. Design and construction of food waste biogas plant for hostel mess. IJSRD, 3(03), pp. 101-04. Melikoglu, M., et al., 2013. Analysing global food waste problem: pinpointing the facts and estimating the energy content. Central Europ J Eng, 3(2), pp. 157-64. Paritosh, K., et al., 2017. Food waste to energy: An overview of sustainable approaches for food waste management and nutrient recycling. BioMed Res Intl, 2370927, pp. 1-19. Kumar, S., et al., 2017. Challenges and opportunities associated with waste management in India. R Soc Open Sci, 4(3), pp. 160764. Recycling Organic Waste report (2015). Practical Action. http://www.nswai.com/pdf/tc_ 30mar15/recycling%20organic%20waste.pdf. Brod, E., et al., 2012. Fertilization effects of organic waste resources and bottom wood ash: results from a pot experiment. Agric Food Sci, 21(4), pp. 332-47. KÃÂ¡ra, J., et al., 2009. New mixtures and technologies for biogas production at biogas plants of agricultural type processing livestock slurry. Res Agr Eng, 55(2), pp. 62-8. Girotto, F., et al., 2015. Food waste generation and industrial uses: A review. Waste Manag, 45, pp. 32-41. Okonko, IO., et al., 2009. A Utilization of food wastes for sustainable development. Elec J Environ Agri Food Chemist, 8(4), pp. 263-86.
van der Werf P., et al., 2018. The quantity of food waste in the garbage stream of southern Ontario, Canada households. PLoS ONE, 13(6), e0198470. Chakona, G., et al., 2017. Local setting influences the quantity of household food waste in mid-sized South African towns. PLoS ONE, 12(12), e0189407. Ventour, L., et al., 2008. Food waste report. http://wrap.s3.amazonaws.com/the-food-we-waste.pdf. Hla, SS., et al., 2015. Characterisation of chemical composition and energy content of green waste and municipal solid waste from Greater Brisbane, Australia. Waste Manag, 41, pp. 12-9. Ali, G., et al., 2012. Green waste to biogas: Renewable energy possibilities for Thailand's green markets. Renew Sustain Ener Rev, 16 (7), pp. 5423-29. Benbelkacem, H., et al., 2010. Effect of leachate injection modes on municipal solid waste degradation in anaerobic bioreactor. Biortech, 101, pp. 5206-12. Brown, D., et al., 2013. Solid state anaerobic co-digestion of yard waste and food waste for biogas production. Biortech, 127, pp. 275-80. Abdelhay, A., et al., 2016. Optimization and modeling of biogas production from green waste/biowaste co-digestion using leachate and sludge. Clean-soil, air and water, 44 (11), pp. 1557-63. Gosavi, PG., et al., 2010. Biogas and marine board using waste green leaves. JERAD, 4(3), pp. 695-704. Lemmer, A., et al., 2002. Use of grass or field crops for biogas production. In proceeding of the Ag Eng Budapest, Hungary, 2, pp. 152-53. Pick, D., et al., 2012. Biogas production potential from economically usable green waste. Sustainability. 4, pp. 682-702. Ilaboya, IR., et al., 2010. Studies on biogas generation from agricultural waste. Analysis of the effects of alkaline on gas generation. WASJ , 9 (5), pp. 537-45. Muradin, M., et al., 2014. Potential for producing biogas from agricultural waste in rural plants in poland. Sustainability, 6, pp. 5065-74. Karellas, S., et al., 2010. Development of an investment decision tool for biogas production from agricultural waste. Renew Sustain Ener Rev, 14, pp. 1273-82. Achinas, S., et al., 2016. Theoretical analysis of biogas potential prediction from agricultural waste. Resource-Efficient Technol, 2(3), pp. 143-47. Salihu A., et al., 2016. Pretreatment methods of organic wastes for biogas production. J Appl Sci, 16 (3), pp. 124-37. Fuerstenau, DW., et al., 2002. The energy efficiency of ball milling in comminution. Int J Miner Process, 67, pp. 161-85. Â¡ic, V., et al., 2015. Effect of extrusion pretreatment on enzymatic hydrolysis of miscanthus for the purpose of ethanol production. J Agri Sci, 7(11), pp. 132-42. Guizhuan, X., et al., Anaerobic fermentation characteristic of green corn straw pretreated by steam explosion. Trans Chin Soc Agric Eng, 28, pp. 205-10. Laser, M., et al., 2002. A comparison of liquid hot water and steam pretreatments of sugar cane bagasse for bioconversion to ethanol. Bioresour Technol, 81(1), pp. 33-44. Wei, wei L., et al., 2012. Effects of pretreatments with steam explosion using solar energy and microwave irradiation on biogas production of corn stalk. Trans Chin Soc Agric Eng, 28, pp. 227-34. Song, Z., et al., 2014. Comparison of seven chemical pretreatments of corn straw for improving methane yield by anaerobic digestion. PLoS ONE, 9, pp. 1-8. Zheng, M., et al. 2009. Enhancing anaerobic biogasification of corn stover through wet state NaOH pretreatment. Bioresour Technol, 100, pp. 5140-45. Ashok Kumar, S., et al., 2014. Biogas Production from kitchen waste water using USAB Reactor. Int J Chem Tech Res, 6(9), pp. 4135-42. Toma, L., et al., 2016. Animal manure as substrate for biogas production. Malinovska L, Osadcuks V (Editors). 15th Internal Scientific Conference "Engineering for Rural Development", Jelgava, Latvia. pp.629-34. Tufaner, F., et al., 2016 Effects of co-substrate on biogas production from cattle manure: A review. Int J Environ Sci Technol, 13(9), pp. 2303-12. Regattieri, A., et al., 2018. Biogas Micro production from human organic waste- A research proposal. Sustainability, 10, pp. 330. Dinuccio, E., et al., 2010. Evaluation of the biogas productivity potential of some italian agro-industrial biomasses. Bioresour Technol, 101(10), pp. 3780-83. Liew, LN., et al., 2012. Methane production from solid-state anaerobic digestion of lignocellulosic biomass. Biomass and Bioener, 46, pp. 125-32. Wu X., et al., 2010. Biogas and CH4 productivity by co-digesting swine manure with three crop residues as an external carbon source. Bioresour Technol, 101(11), pp. 4042-7. Deressa, L., et al., 2015. Production of biogas from fruit and vegetable wastes mixed with different wastes. Environ Ecology Res, 3(3), pp. 65-71. Zhang, Q., et al., 2016. Biogas from anaerobic digestion processes: IJRER, 98, pp. 108-19. Vandevivere, P., et al., 2003. Types of anaerobic digester for solid wastes. In Mata-Alvarez J, editor. Biomethanization of the organic fraction of municipal solid wastes. IWA Publishing, pp. 111-40. Mir, MA., et al., 2016. Design considerations and operational performance of anaerobic digester: A review. Cogent Eng, 3, pp. 1181696. DohÃÂ¡nyos M., et al., 2004. Improvement of anaerobic digestion of sludge. Water Sci Technol, 49(10), pp. 89-96. Yang, X., et al., 2010. Transferring of components and energy output in industrial sewage sludge disposal by thermal pretreatment and two-phase anaerobic process. Bioresour Technol, 101 (8), pp. 2580-84.